Alan: I’m here, Tim. It’s great to be here. years now. I am an Investment Advisor representative as well, so we gather assets under management as well as other parts of the financial services. want to ask you about, Alan, before we dive into how things are going for you now, let’s go back to before you got RetirementView. What kind of things did you struggle with? What were some of the problems with meeting with prospects, people you’re trying to show your value to, to bring them on as clients? What were your challenges? toward it when they’re looking at RetirementView. up in that seat and get closer to that monitor. My desk is set away from the monitor and they’re sitting at my desk looking at me. table to even get a closer look. It’s just amazing. I love it. where I got on YouTube and saw how the two of you were building it out on that. just, it’s really exciting watching them. 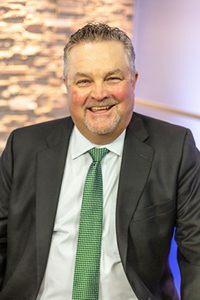 the, “Hey, I now have the software,” and what the challenges were. people the problem that they needed to solve, right? and we’d have to go through so many pages. you take them to their current age and move along. When we do have the red, after we’ve put in all their assets, then we’re going to talk about at that point, maybe some changes we could make. Getting them some guaranteed lifetime income. If there’s not anything there to help that money, even when they do run out, to have more guaranteed income rather than just with social security. We do build other income in there with maybe some indexed annuities or something to that effect. When we do that and can show them how we can answer that problem, that helps as well. Where in other software that we’ve had in the past, it just didn’t seem like that was there. Tim: Okay. You struggled with showing them when they’re going to run out of money, showing them how their investments and social security is going to play into their retirement. Tim: You didn’t really have an easy to way to show that. that point? Like how did the meeting go? my closing ratio already, and I think it’s just going to help it that much more. annuities? Or what type of annuities you doing? Tim: Okay, so they’re going to get 25,000 for life. depends on whether it’s qualified or not really. awesome because I can tell how excited you are. understood it. They saw the red. under management and 50% driving income. actually have more assets to pass along to their heirs at the end than they would have if they had not started the income, so that, to me, that’s a beautiful picture to paint for them. meet with your first client or prospect. you’re correct as to what’s wrong. software as well, usually when I’ll speak with them. Tim: Well, good. That sounds awesome. It didn’t take long to learn how to use the program. training class to learn how to use this? Alan: No, no. It’s really incredible. get going. What did you do? numbers. Sometimes we’d just have to put in her social security benefit. they’re going to have a shortfall, and we start working from there. putting each asset as to what it was, and you don’t want to do that. Correct? decide how simple or detailed to do it. Tim: Let’s say Mark has a regular IRA. the same amount of money we had that we were just putting in as a thumbnail. bunch of accounts, you may be better off listing them on here. then I’ll save that particular client in their current situation. money has been moved from and into what, and then showing the income as well. income at age 90, 95, 100, whatever we’re building it out too. and used the software on during that time, approximately? with probably here in a couple of months. in assets that we’ll be managing and into annuities. and half on that one. 50% into annuities and 50% into managed money. this money moved, and become a very good client already on some other cases. We’ve done some life insurance already. this short period of time as far as new clients. Tim: You even got another sale from one of those clients by reviewing their situation. Tim: Would you say then that the tool is great at solidifying existing client relationships? it as we go. I love it for annual reviews as well. closed five and you’re going to, you think you’re going to close another five. Tim: That’s 10 out of 15.
only closed about half that percentage? Somewhere around 30 something percent? Alan: Yes, yes. Probably 30 to 40% is where we normally are. they’re going to average between 12 to 13,000 per case. the annuities and the managed money that’s going into it. each client that it’s given me. that. They want the red to go away, just like I do. when they see that red, all of a sudden they’ve got a bunch more money. “Oh, Alan, I forgot to tell you about this other account.” Right? Tim: They’re cautious, they’re cautious. once they see RetirementView, it’s incredible. more and sit even closer, right? Alan: That’s right, absolutely. They’re either sitting on the edge of their chair or their moving to one that’s closer. Absolutely. manage over the next few years. easier now with this, so it’s exciting. magnetically attracted to you… After doing RetirementView? four and a half percent. helps, I think, with them. it’s really a good picture for them. I think that helps. our managed money over the next five years. get their clients excited, RetirementView is it, man! I look forward to getting better at it all the time. Tim: All right. Well, thanks again for your time. This is Tim Turner and Alan Cantrell. We’re signing off, and happy planning. We’ll see you. Bye. On this webinar, You will learn about our new Explosive Lead Gen System…. Do you know what it’s like to have some explosive power behind your practice? Many advisors like you are using the RetirementView software to skyrocket what you do in one-on-one conversations with prospects and clients. You are getting rid of the “red” on a daily and weekly basis…. and helping people in the process. But what if you could take that rocket fuel and apply it to your “lead generation” efforts? Did you know that I invented the idea of a web financial calculator back in 1994? I designed the first retirement calculator, the first Social Security estimator, the first Risk Profile analyzer and many more. Well, we heard you loud and clear! 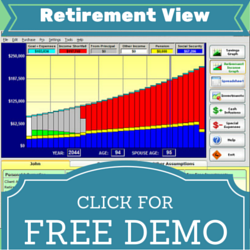 We have created a “lead generation” version of RetirementView that runs from your website. It looks nearly identical to the desktop version, but it’s web based. It does NOT let the prospect use every aspect of the software. They can’t create a couples plan or add cash infusions and special expenses. Clicking on those things tells them to contact YOU! Or to set up an appointment with you… typically using a Calendly.com type of system. What does that let you do???? Yep. You can email it out to a list. You could mail post cards about it. You could let “groups” access it ….and it is advertising YOU and YOUR PRACTICE the entire time. You can hang it off your existing website OR we could put it on it’s own domain name for you if you like so you can do ultimate tracking on it. Make sure you attend the WEBINAR to learn all about this new system! AGAIN SEE YOU ON THE WEBINAR – DETAILS SHOULD HAVE BEEN EMAILED TO YOU DIRECTLY FROM GOTOWEBINAR! P.S. 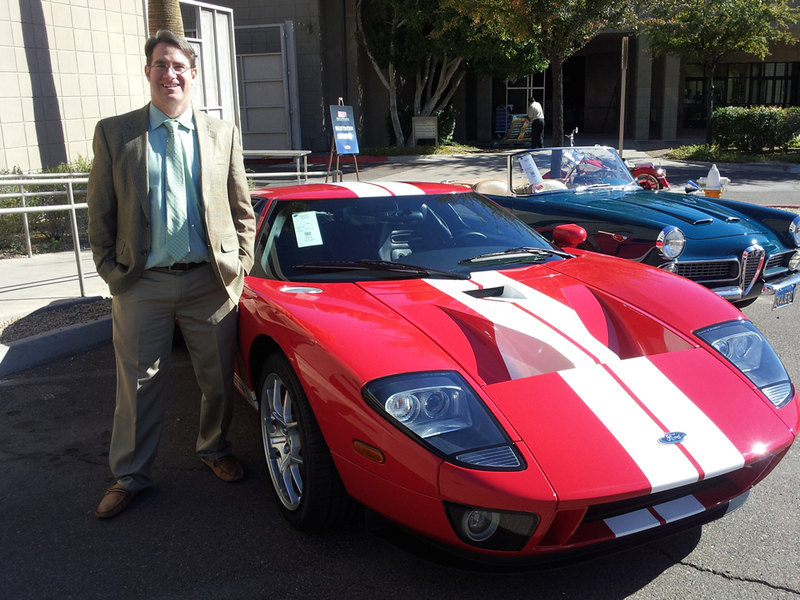 No this is not my car… Ford GT350 I think at a car show that was at a conference in Phoenix a few years back. In honor of this great holiday, we’re making you this explosive offer! You can light up your lead generation by getting the “RetirementView 360 CLOUD Lead Generation Tool”. social media images you can post to Facebook, LinkedIn, etc. To take advantage of this incredible lead generation package, click here to order. This offer is only good through Wednesday July 11th, 2018, so don’t delay. From all of us here at Torrid Technologies, we hope you have a very happy and safe 4th! Are you confident and ready for retirement? Most people don’t know. Take our quiz to find out. …SCROLL TO END OF ARTICLE FOR A SPECIAL OFFER…. May the 4th has become known as “Star Wars Day”! Built on the idea of May the 4th be with you. 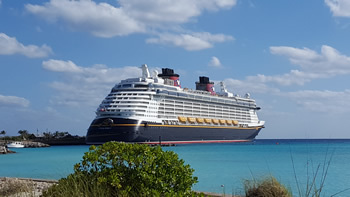 I wanted to use this day to tell you about my recent trip on a Disney Star Wars cruise. 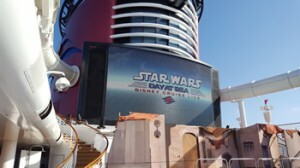 I got to take my wife and 2 youngest sons (still in high school) on the cruise which offers Star Wars movies, characters, memorabilia, and of course the awesome “Star Wars Day at Sea”. Being like a big kid, I signed up for a couple of “character encounters”. 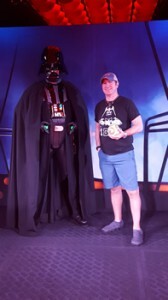 Tim gets to meet Darth Vader! My encounter with Darth Vader was quite scary. The dude is like 6 foot 8 in the Darth costume and he has the “real” James Earl Jones voice – I assume from a voice converter box. He said that I looked like I might be part of the “rebel alliance”. I was lucky to even get a picture before he pulled out his light saber and tried to chase me down! On another encounter, I got to meet R2D2 and C3PO. These droids were alive and active. C3PO shook my hand when I walked up and talked to me ad lib in the C3PO voice. Meanwhile, R2D2 was blinking and chirping with his computerized “voice” during the entire photo encounter. It was so real I couldn’t believe it. I had to get a photo to “prove” I met two of the most outstanding movie characters of all time. Although R2D2 is soooo cool, the wit and wisdom of C3PO has always made him my favorite. Tim meets his mystery friends.. R2D2 and C3PO. My wife and kids were too tired to want to get up to meet R2D2 at 8am. Sure I was on vacation but I would have gotten up at 5am to see these guys! 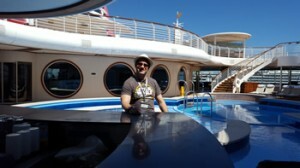 During the cruise we could watch any Star Wars movie we wanted on demand except Force Awakens which was only in the theater. They have a full size theater on the ship just for showing movies! 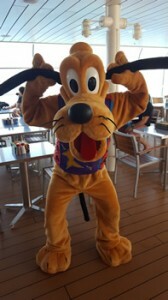 On the ship’s opening departure party, they have a lot of Star Wars and Disney characters there to “see us off”. This deck party has a lot of music and dancing and typical Disney show flare. On the Day at Sea you can buy the BB8 cup (you can see it in the Darth Vader picture) or a Bobo Fett cup. They double down on the movies and show Star Wars the CLone Wars cartoon on the huge deck screen. At night they have another deck party where there is a mob of people dancing and celebrating in Star Wars costumes. There are so many light sabers out on the deck and costumes that it makes for a really cool experience. 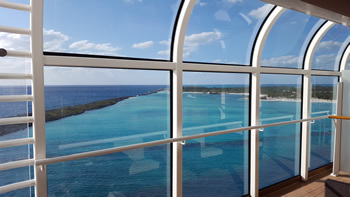 This article is mainly about “STAR WARS” but the cruise itself is fantastic. I’ve added a couple of pictures at the bottom if you want to see them. SPECIAL OFFER: MAY THE FOURTH BE WITH YOU! IF you are smart enough to follow these directions, you will be rewarded with a 20%, 30% or even 40% discount on our RetirementView software. And this promotion is good for ANY edition. – go to the page for the edition you want to purchase. Personal or Couples or Professional Edition. – Complete the purchase process and enjoy using the RetirementView software! May the Fourth Be With You in Your Retirement Planning! THESE SPECIAL DISCOUNTS END FRIDAY MAY 5th at MIDNIGHT! View from the ship of Disney’s private island Castaway Cay! The dude is like 6 foot 5 in the Darth costume and he has the “real” Jame Earl Jones voice – I assume from a voice converter box. He said that I looked like I might be part of the “rebel alliance”. I was lucky to even get a picture before he pulled out his light saber and tried to chase me down. 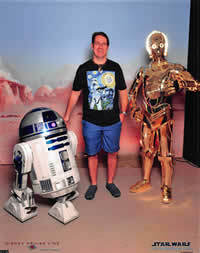 On another encounter, I got to meet R2D2 and C3PO. These droids were alive and active. You may be bombarded with messages to “make your IRA contribution” this time of year. For 2017, you have until April 18th tax day to finalize that contribution for the 2016 calendar year. I was curious as to whether we could calculate various contribution amounts over many different time periods to see how long it would take to accumulate $1 million in an IRA. So I fired up an Excel spreadsheet mainly because I wanted to create a matrix that shows many results in a small window. Normally I would have fired up my RetirementView software and just run some numbers in there. But if I did that I would have to run each scenario and then log the results. Here is the “cheat sheet” that I created in Excel for 2017. To explain what this means, I first explain that the entire calculation is based on a flat 5% return. If you had my spreadsheet, you could change this return and have the matrix recalculate all the values at a different return. The left column in blue shows the number of years until retirement – this is the number of years that you “save” the amount specified in “Annual Savings”. The green “Annual Savings” columns are showing you the calculations if you save $1,000 each year or $2,000 each year…. for the time period in blue. The yellow area shows you the total amount accumulated for the time period including the compound interest of 5%. Did I get to $1 million? No. The only place we got close was if we saved $5,500 a year for 45 years. My guess is if we increased the interest rate to 6% we would be over the top. So I did that in my Excel spreadsheet and voila the $5,500 for 45 years gets us to $1,240,295! If you’d like to get a copy of my little IRA Contribution cheat sheet spreadsheet in EXCEL format, then CLICK HERE to get your copy of the Cheat Sheet for FREE. What if YOU lived to be 117? 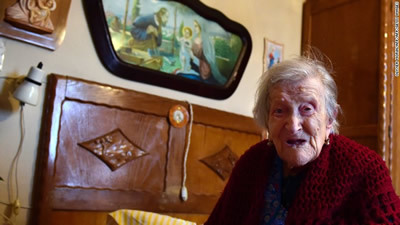 Well it’s official the oldest living person on planet Earth is Emma Morano. She lives in ITALY of all places. What is her secret to long life? She says eating 2 raw eggs every day! Now what will happen if you live to be 117? Our programming gnomes put together a little spreadsheet for you to figure it out. On this spreadsheet it will show you how much money you need to live from age 65 all the way to age 117 at two inflation rates – one at 2% and the other at 3%. Here is what we did. We assume that you retire at age 65 and then live to be 117 years old. We assumed that you need just $50,000 of income starting at age 65. Yeah we realize that you may require much different income. We then used a 2% inflation rate in one set of calculations and a 3% inflation rate in the other set of calculations. 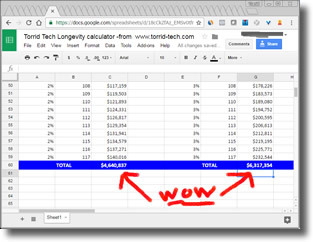 The spreadsheet then TOTALS up all of the income from age 65 to 117 to give us a running total of dollars you would need over that time period. So can you make it for 52 years in retirement? Click here to find out. 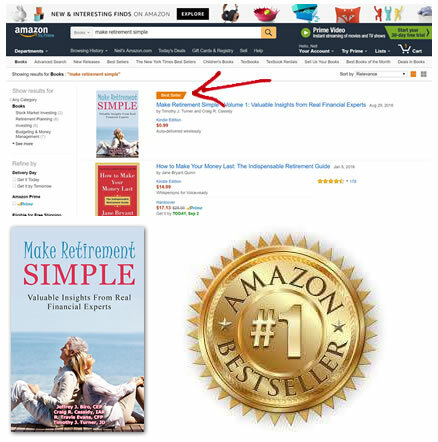 My first book has been published on Amazon Kindle and hit #1 on several of the charts! It’s very exciting. The print version will be coming out in the next couple of weeks. I’d just like to thank my co-authors Travis Evans, Craig Cassidy, and Jeff Biro. Congratulations to you guys too for being a “Best Selling Author”! 5). you get unlimited support by e-mail and phone. 6). you get our iron-clad 100% 90-Day Unconditional Money Back Guarantee (new customers only). 7). you get our online training videos that teach you how to use the software. If you’d like to get this, click here to order!